Love is not always supposed to be easy. Sometimes it is a choice. Sometimes, when apathy would be easier, it is a hard choice. Still, it has always been so easy to love her. It was easy to hold her hand as we walked past the Christmas lights downtown and watched other couples slip and fall and laugh on the ice rink. It was easy to hold each other tightly when something made us cry. It was easy to read her writing and be amazed by her words. It was easy to sit and talk through our problems, the bumps and bruises common to any serious relationship. What was hard, for me, was being comfortable with the empty space, with the times we could not be together. Jealousy, despite the cheesy outcomes of many teen movies, is not conducive to healthy relationships, and that was becoming very apparent. I swallowed the irrationality, kept it deep where it couldn’t hurt us, but it still hurt me. Recognizing its absurdity failed to exorcise it. I fell in love in autumn, when the leaves were changing and sailing to the ground, and the city sky was growing more and more gray. It was easy, like falling asleep after a long, heavy day. It was sweet like honey and my grandmother’s marmalade. It was gentle and kind, and her smile felt like the sun peeking out from behind a quilt of clouds. I fell in love after having been cheated on twice before, and when autumn ended and winter came with its chill and snow and slush, I had never been happier, or more jealous. Jealous, paranoid of losing her. My past made a monster of whatever space came between us: a weekend home with her family, a vacation spent apart, a friend from work she grabbed lunch with one afternoon. I didn’t say anything. I knew how ridiculous and ill-founded my jealousy was. That didn’t stop it from swallowing me at times, alone in my room waiting for a text during her busy day. The things I fell madly in love with her for doubled back and ate at our time apart. Her wild, fierce intelligence, her ability to make friends with absolutely anyone, her independence, her free-thinking, her adventure. All the things that drew me chest-racing towards her became things over which I, in my weaker moments, chewed my nails down to the nub. It was one of those times when we were apart on holiday, missing each other over text messages, each spending time with our families, when I decided to visit a museum. She was spending the day with her high school best friends and I was spending mine trying to ignore the jealousy the was making my chest tight every time I checked my phone. Art has always been a part of my DNA — my parents, both architects, had taken me to art exhibits every two or three months since I was a child — and on this lonely, early afternoon I decided that I needed beauty. I thought that maybe it would soothe the jealousy, even slightly. Maybe seeing art would feel like being with her, at least a little. I took the ferry from downtown Boston to Salem, Massachusetts, and went to an exhibit on Rodin at the Peabody Essex Museum. I walked into the building, bought a ticket, walked up the stairs, and opened the door leading to the exhibit filled with beautiful casts, preliminary sketches, and plaster molds of the great sculptor’s work. The cathedral (1908). Auguste Rodin. Photo: Daniel Stockman. The very first piece I saw was a bronze cast of The Cathedral. When I laid eyes on it — the two bronzed hands stretching towards one another, wrapping around the air between them, making a ballet of the empty space — I cried out. I couldn’t help it. It was a soft and gentle cry, the kind no one would notice. I stood transfixed by the beauty and simplicity of the sculpture. Many people walked right by it, more eager to stare at the casts of larger, perhaps more famous pieces, but I couldn’t pull myself away from the two hands. They, in their frozen longing, looking remarkably cathedral-esque, felt so familiar to me. I knew the space between hands. I felt how eternal not touching someone you loved could feel. I had felt it as I walked into the exhibit. I felt it in that moment. I was captivated by the way the sculpture plays with air. The negative space it creates is perhaps its most beautiful aspect. While the two right hands, belonging to two different figures, gently reach for each other, the fingers of one hand curving towards those of the other, they do not, at any angle, touch. Yet in this I saw no hint of tension, no desperation in the hands. I wondered how this could be. How eternal separation could look so gentle. A young girl walked to the piece with her mom, read the description between the piece, and began walking around it, getting as many different angles as she could. I think she was looking to see if they touched. It was watching the young girl search for a point of contact that made me suddenly understand why The Cathedral had brought quiet tears to my eyes. There was such a contentedness in its trenchant, insistent separation. Not only that, there was beauty. It inspired a profound peace. 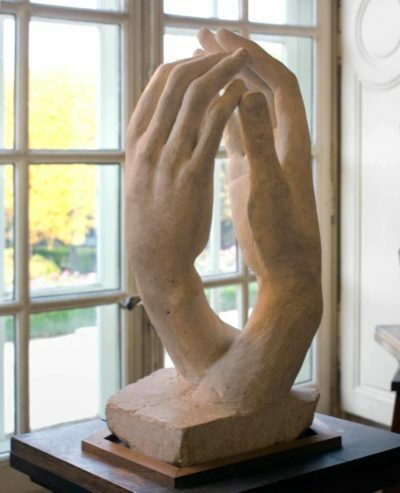 The way Rodin controls the atmosphere between these hands was like a revelation to me. Empty space has its beauty. Empty space births a love all its own, capable of fascinating and inspiring the old and young. Separation can make a music out of emptiness. 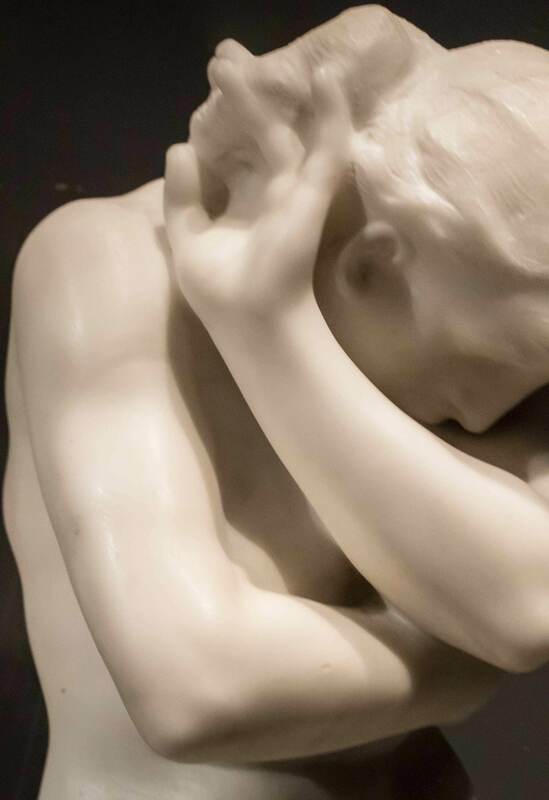 The space between a face leaning as close as it responsibly can and a sculpture, between a married couple standing only inches apart, between two young lovers separated by hours, can be immensely beautiful. It would sound absurd to claim that The Cathedral cured my jealousy. If deep emotional conflicts were that easily resolved, therapists would simply diagnose weekly visits to the nearest art museum. I don’t know, though. Rodin’s work threw some powerful kind of switch in my head that day. Recognizing how wonderful a small separation can be shifted something within me. Isn’t that what great art is capable of doing? Rearranging the furniture of one’s mind? The Cathedral blessed me with a kind of wisdom that I carried with me after I left the Peabody Essex Museum. It was a kind of wisdom that helped me beat my jealousy back to its small, ancient cave. There are still moments, when she is too far away to whisper secrets to, that jealousy returns, but like a meditation, I turn my mind to The Cathedral. I see the space made sacrosanct between two palms, and I smile, and watch that sliver of jealousy recede and let my imagination make art of the space between. Spencer Nitkey is a writer and student studying English, creative writing, and Education at Temple University. This article originally appeared in the online publication Critical Read and is reprinted here with permission.